We at Scotsman will ensure that your collection will reach its maximum potential. This process is attainable because of our unmatched expertise, experience and market knowledge. And, our professional staff makes the process simple and easy so that the sale of your collection will be a most rewarding experience. Once you decide to sell, your first step is to contact our consignment department, where we will discuss your items for sale and your goals for selling those items. Then, one of our experts will appraise your items. After this evaluation, we will present our recommendation for the best course of action for you to achieve your goals. What is best for you – auction or outright sale? We provide you both options and will explain to you the difference in possible results. As a general rule, items of higher value and/or truly unique items are best suited for an auction event. On the other hand, it is often smarter to sell generic, more common grade material outright. Of course, we will assist you with this decision. Selling outright is quite simple. We inspect each and every item in your collection and then give you our offer to purchase these items. You can then decide to sell your entire collection or just certain items. Once you decide, we will pay you immediately in cash, by check, in trade, in gold or in various proportions of any of these options. There may be no more rewarding or exciting selling venue than selling at a live public auction, specifically a Scotsman auction. 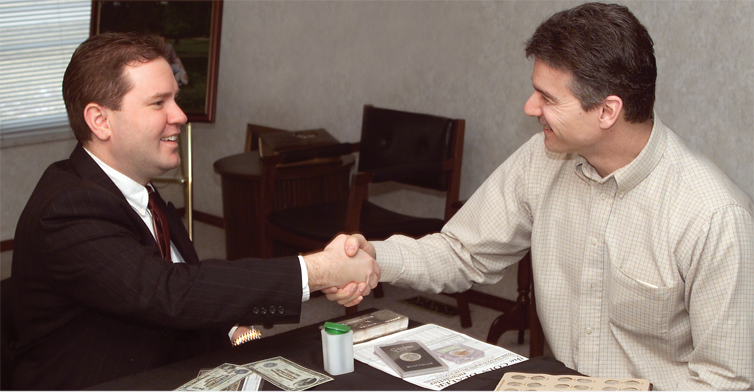 The bidders attend for a reason, to buy rare coins and paper money, and aggressively bid against each other for items they need for their collection or inventory. Scotsman Action Co. gives them the opportunity to view numerous quantities of collectibles at one central location, and at their convenience. They receive deluxe printed catalogues in the mail, can view professional color images and bid online, and also have the opportunity to attend lot viewing at various times, either in our store, or the viewing area at the auction location in the days leading up to the sale. All of these "additional advantages" means higher prices realized and more money for you! If you want your money quickly from auction decision, Scotsman will accommodate you. We offer favorable advancements or pay consigners just 30 days after the sale. Plus, our minimum price guarantee assures you will receive no less than our “selling outright” offers. This means we completely remove any downside to you in an auction, which is being charged a seller’s commission for an unsold lot. You will find our consignment terms quite favorable and you’ll be even more pleased with the service we provide and the results we deliver for you.